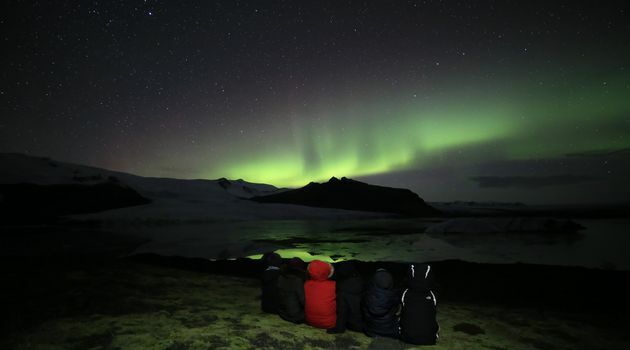 This Private northern lights hunt in Iceland takes you in an original monster truck by superjeep out of town to avoid light pollution so as to observe this fascinating natural phenomenon also known as the Aurora Borealis. Given clear skies and a little bit of luck, sightings can occur from autumn to spring. The main 4X4 10 Passenger Monster Trucks are the 6-door Ford Excursions. All are modified with big 46-inch wheels ready for the mighty challenge the tours offer every day, all year round! The jeeps are equipped with an extra fold-down step for easy accessibility, luxurious leather seats, air-conditioning, WiFi, GPS, first-aid kit, trackwell, and other sorts of security equipment. Behind the wheel on the tours are experienced driving guides that sure know how to maneuver such big jeeps in the wilderness and highways of Iceland. This 4-hour private tour has a max of 10 passengers per Monster truck for you or you group only. The elders say that the harsher the night‘s frost, the more intense the colors will be. Swirling and swaying overhead, displays are usually greenish-yellow but white, red, and pink lights can also appear. You will be picked up at your hotel at 8pm or 9pm (depending on the season) and taken out of Reykjavik right away. The direction and the next stop will always depend on the weather and the ‘aurora forecast’. You will be taken to the viewing locations where you are most likely to spot the northern lights. All effort will be made to take photos of you with the northern lights in the background, at no extra charge. The private northern lights monster truck hunt is dependent on the weather and sky conditions, and the right is reserved to cancel at any time. If the evening tour goes ahead and the northern lights are not seen, you will be offered to try once again for free! If there is a need to cancel all your nights due to bad weather, you will get a full refund. Make sure you book your northern lights in Iceland tour for your first night in town in order to maximize your chances of sightings. Northern Lights Jeep Hunt - get the lights will you?